Even though this is more of an optical illusion, I haven’t done an animal camouflage post in a while and I was excited when I came across this. 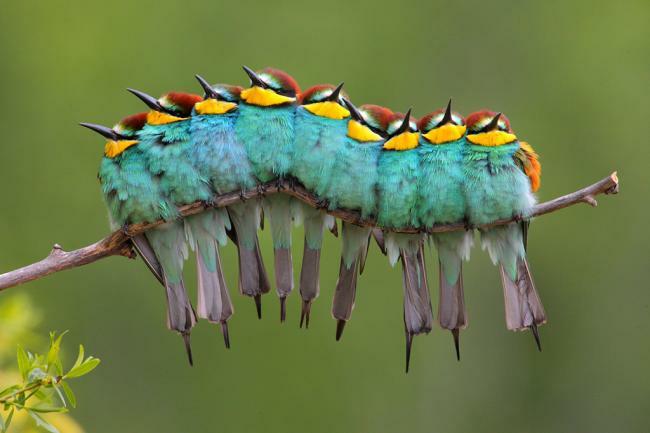 It might look like a caterpillar at first glance, but it’s actually a tight knit group of birds called European Bee Eaters that are huddled together to keep warm. Photographer José Luis Rodríguez even calls this Oruga de Plumas, or Caterpillar of Feathers. This was the winning image in the European Wild Wonders photo competition. Love these guys! I thought it was a caterpillar! So beautiful. I would want to be in the middle to be the warmest! Muah!